Over the past six months, recent ACW graduate, Dorothy Hunter and current ACW MFA student, Hannah Tiernan have been undertaking independent lines of enquiry within the centre’s archive. 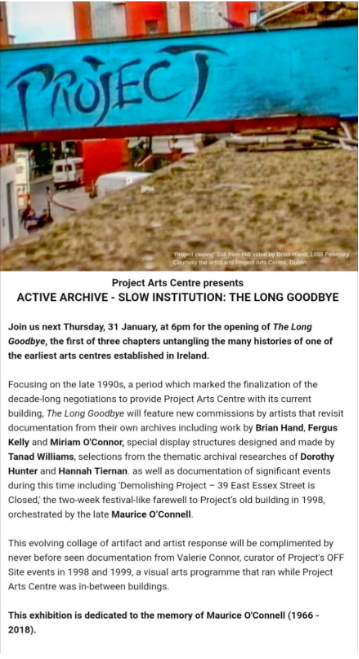 The Long Goodbye exhibition, which opens on Thursday 31st January, is the culmination of this project and will feature highlights from their research. Dorothy has been researching the disparate threads connected to the “eventualisation” of the Project fires, such as the tension between symbol-making and destruction, how protection and aftermath are dealt with, art that was destroyed and made, and the layered proxy existences within the archive. Hannah’s research into the LGBTQ+ theatre of Project speaks to the Art Centre’s importance as an artist-led organisation. Having been at the forefront of presenting cutting edge, contemporary and often controversial work, this research looks at the legacy of such an institution and how this reflects in today’s practices.